This weekend, it's all about chillin out! I caught my two darlings in a rare moment which I managed to capture. Couldn't wait to share it with all of you. Boo the cat and Kits were snuggling together for their afternoon nap. In the first picture, they were waken up by me when I took their pictures hence the open eyes. After they realised it was just me being trigger happy, they settled back to sleep. Although both of them are not related, they're extremely close as Boo the cat had adopted Kits as her father/mummy figure ever since I seperated her from her mother. I'm not too sure who is hosting WCB this weekend, so if you do know, leave me a comment and I'll link the round up. Happy Weekend! *Found it, it's The Hidden Paw, so check it out for the round-up. It's taken me quite a while to venture here probably because of the traffic jam that clogs up the entrance to Bukit Tunku. One day, I decided to brave it and found it wasn't too bad since they have open the ramp directly to Segambut/Jalan Ipoh. I'm glad I did make the effort as I got to savour their fantastic lontong. The only thing which I didn't like was the technicolour orange it came in. I suspect it was also an effect of taking the picture under an orange canopy hence the extreme orangey-ness of the lontong. Tastewise, it was rich but the consistency was not too thick making it extremely slurpy. Eaten with slightly soft nasi impit (compressed rice cubes), vegetables and tempe plus topped with sambal sotong, it was hard not to lick the bowl dry. I especially liked their sambal sotong which wasn't too soft but had a nice bite to it. However prices here are of course higher than the normal Malay stall and my bowl of lontong was slightly less than RM10. Business has been good and they now boast of three more outlets scattered around town. I've also sampled their kuih muih (Malay cakes) before in a previous visit and they're pretty good too. Will definitely have to come back to try their various dishes for lunch. 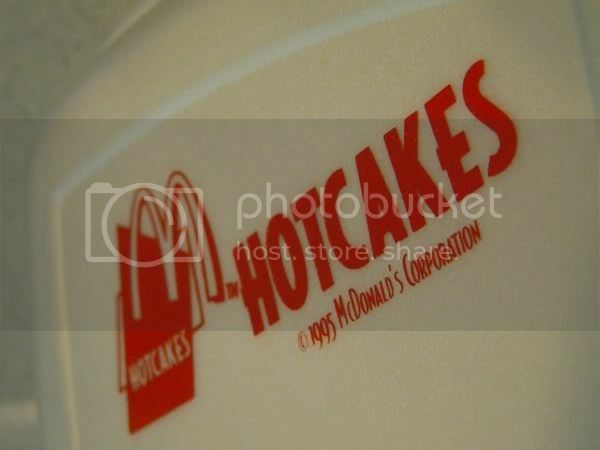 When I heard through the great grapevine that Hotcakes had arrived in Malaysia, I was jumping up and down with joy! No need to wait for a visit to McDonalds over the Causeway or travel far far away to indulge in my little fetish for these delicious babies. Tracking these down were quite a task as somehow I never saw any announcement heralding their arrival to our shores from Golden Arches, the franchise holder in Malaysia for McDonalds. I finally did figure out where they were found and sampled them recently. Served piping hot with a fluffy and light texture, they were delectable with butter and hot syrup poured over a stack. Absolutely dangerous stuff as it's available all day and night hence I can satisfy my cravings for them whenever I have the urge. Besides the hotcakes with butter and syrup (RM5.99+) they also serve it with Sundae ice-cream with a choice of strawberry or chocolate flavours (RM6.80+). It's also available during breakfast whereby it's served with sausage. 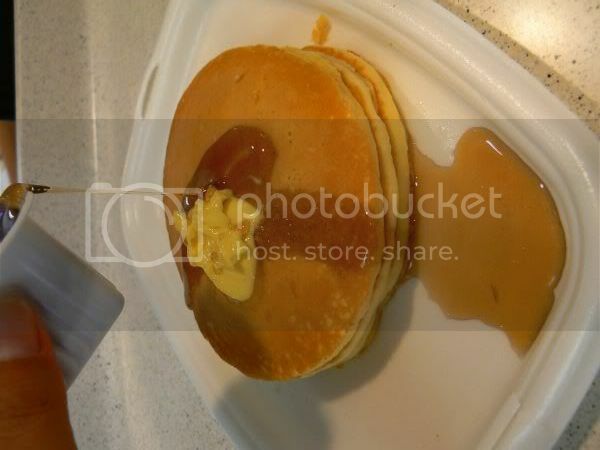 To sample these yummy Hotcakes, drop by the McDonalds' outlets at Bangsar, Bukit Bintang, Centrepoint, Ulu Klang, KL Sentral, Genting, Taman Connaught, The Mall, Low Cost Carrier Terminal and Section 3 Shah Alam. For full addresses of these McDonalds outlets, check out this link and click on Chilin' Out to track a mcD. 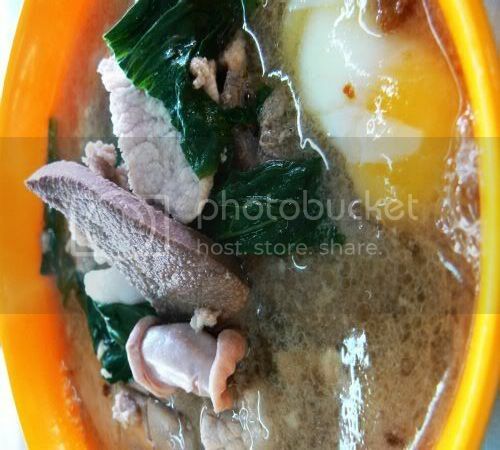 Digging through my archives I found this picture of a very nice Sarawak Kolo Mee I had in Taman Megah. It's not the best picture of it probably because of that day's lighting but believe me it's super tasty. There seems to be quite a few Sarawak stalls within this area - the other corner shop Goodluck has one with quite a few varieties like the lesser known Tomato Kuey Teow while this one serves Kolo Mee and Sarawak Laksa. Run by a couple from Miri, I'm always fascinated with the lady's outlandish hats which she dons while cooking the noodles. The Kolo Mee or what I term as frizzy egg noodles is handmade and tossed in a mixture of garlic oil and I suspect a tinge of lard to give it extra oomph. It's topped with minced meat and slices of char siu with a sprinkling of chopped spring onions. Besides the Kolo Mee, try their Sarawak Laksa which is also very good. The soup broth is not as tasty as the Nam Chuan version but I absolutely love their sambal belachan dip which has a wonderful aroma. 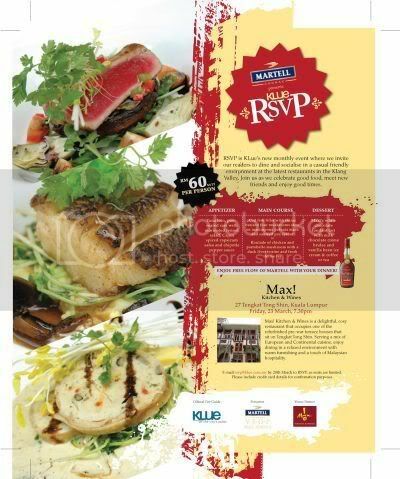 I was really upset when I found out I would not be able to attend this month's RSVP at Max! Kitchen and Wines. Not only did I miss the monthly RSVP again (last month it was due to Chinese New Year commitments) but I couldn't eat at my favourite spot. Looks like I also missed meeting up with floggers - FoodieLianne and mycoffee from Sweets for my Sweet. One small consolation I guess was they snapped pictures of the event which had me drooling and it seems they had a blast too! Now, I wonder if I can persuade someone to take me to Max! for dinner this weekend to compensate for missing RSVP (Hint!!). I almost forgot about these pictures which I took once when I had lunch with a friend of mine - blame it again on my inefficient way of labeling my pictures. She had been raving on about this place hence I was keen to try it. Located in a bungalow, this restaurant is directly opposite the Beryl chocolate showroom. Kinda fun to walk in to that place which I did since I had some time to kill before lunch. Lots of variety and they even have chocolate covered potato chips a la Royce chocolate which mainly cater to the tourists. Parking here can be a pain though as it's pretty limited unless you park across the road where there's a paid parking. My friend did the ordering and since it was the two of us, we had only a few dishes. This place is actually famous for steamboat and fresh seafood but we went for their cooked dishes. 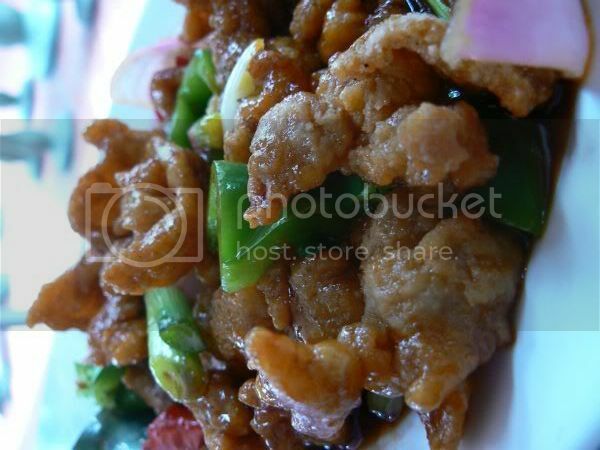 First, we had their famous pork neck dish cooked in a sweet and sour style. 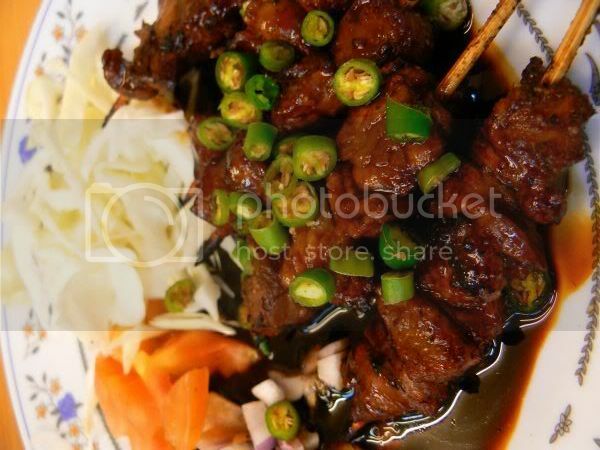 Although they have a few styles to cook the pork neck (one is satay as seen in the other blog review), the most popular is their sweet and sour. I felt the sauce was slightly too sweet, a sign of too much maltose in it but totally loved the soft pork neck which was battered and fried. Using pork neck for this dish was an excellent choice as it's not as dry compared to the other parts. Next was the scary looking Australian Giant Squid Tentacles. 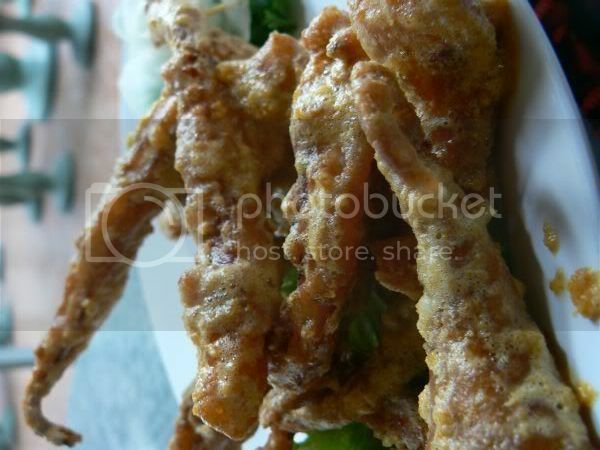 Bearing a slight resemblance to an alien's long fingers, these large tentacles are battered and fried then coated with salted egg yolk. Crunchy with a salty but creamy sauce, this was pretty good stuff. Definitely made a change from the puny squids we get from our local shores. 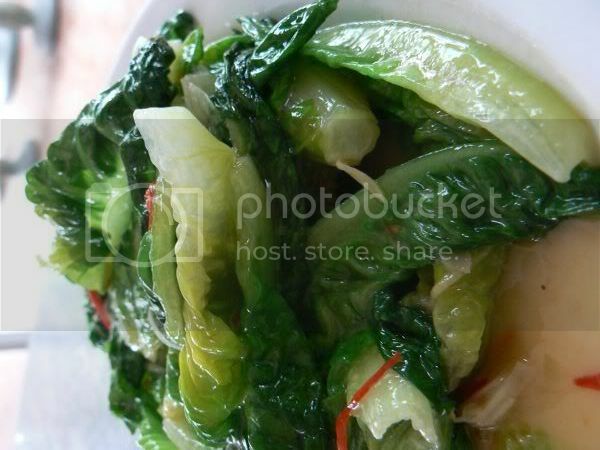 To make us feel less guilty, we also ordered a plain fried Yau Mak (Romaine Lettuce). Besides these items, I was also told they do a pretty good Fried Rice here so do pop in when you're around this area. Prices are also pretty reasonable if I remember correctly. Updated on 9 May, 2007 - Ting Heng is now known as Palm Garden after a management change. Chef has also switched to Imbi Palace and the food is not as good. Disclaimer: The opinions expressed here is entirely based on my personal tastebuds and may vary for others. The reviewer also declares that she has not received any monetary or non-monetary compensation from the restaurant/stall for writing this review. This weekend, it's all about the action! 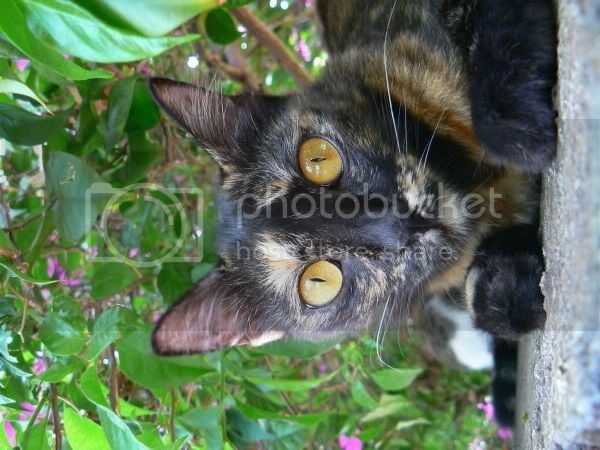 as Fluffy gets ready to sharpen her claws on the palm tree. One thing good about having a huge garden with trees - the kitties have their own scratching posts which they use all the time. Besides sharpening claws, it was a stressful Saturday for all of us as the boy cat had to take his medicine. He was limping a few days back with a wound at the back of one of his legs hence he's now on medication. No more limping and full of energy as it was already a few days after his visit to the vet, he was struggling when we tried to feed him his pills. It was open mouth, put it in and spit out the pill no matter what we did. Eventually we did get some of the pills inside him after a long struggle. For more kitty adventures, tune into Catsynth where the sweet Luna is hosting WCB this weekend. This definitely needs a mention especially for those who love cupcakes (like me!). Will be clearing my time to make it for this as I can imagine what fun I will have snapping pictures of the cupcakes plus tasting them. Note that there's an RSVP on the invite so do remember to tell them how many people are coming to avoid dissapointment with sampling those luscious cupcakes. 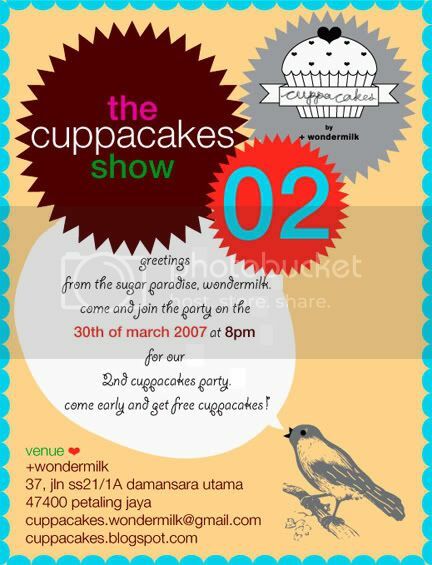 For more details about Cuppacakes by +wondermilk, check their blog plus their flickr account with all their designs. Whenever I'm around Damansara Heights, it's a challenge to find something to eat at a budget price especially at night. Although I have the option to eat at the mamaks, KFC, McDonalds or Secret Recipe, I tend to prefer a quick burger at my favourite Ramly burger stall in front of Pusat Bandar Damansara. 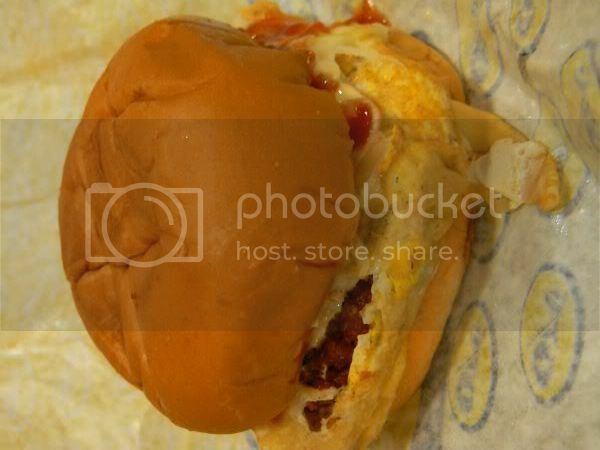 Recently I discovered another alternative - Otai Burger which is selling in front of Plaza Damansara's 7-Eleven . A quick Google search led me to discover that Otai is a new breed of burger stalls that are the brainchild of Suhaimi Abas who started out in Chow Kit. Unlike any of the usual burger places, these stalls were franchises whereby each stall owner would have to undergo training to run the stall. Even university graduates jumped on the bandwagon and a few years ago, there were an estimated 130 stalls around Kuala Lumpur and Selangor. I'm sure the number of stalls have grown as their target is 300 stalls by 2008. Besides the training given to the stall owners, all their burgers are said to have quality control. For me, it's all about the taste of the burger. My daging special (RM3) - beef patty wrapped in egg omelette taken in full glory. 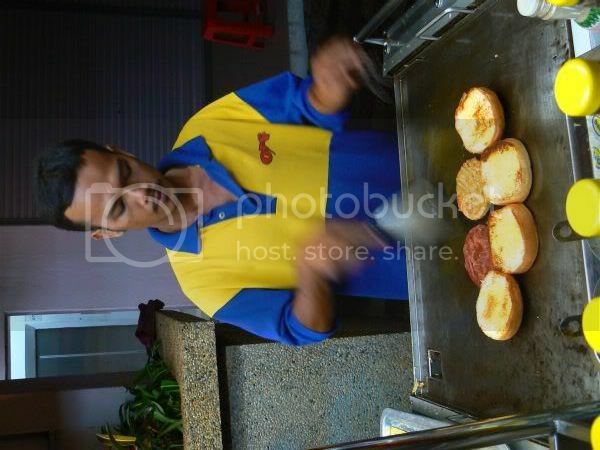 Compared to the Ramly burger stalls, they have a different way of cooking their beef patty. 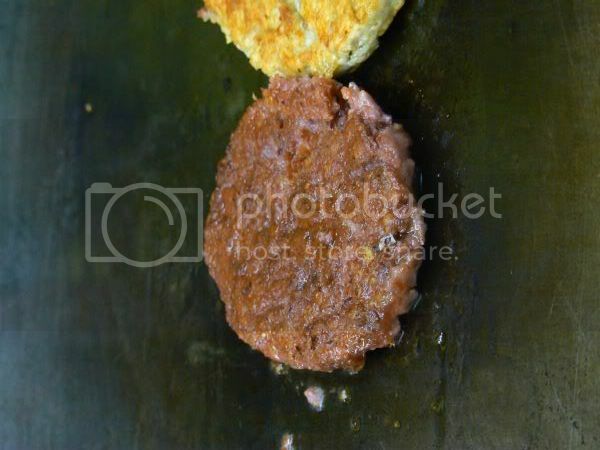 Instead of just cooking it on the hot plate here they use a metal scraper to cut through the patty a few times to cook the inside more. This makes it slightly more crispier versus the other burger places. I also like their buns which feel slightly more softer. Besides that, they have the usual condiments of shredded vegetables, mayonnaise and chili or tomato sauce. Do give it a try and let me know what you think. I kinda like it and tend to switch between the Ramly Burger and this. Besides this stall, I've also seen another one at Taman Tun Dr Ismail - further down from Porto Romano and behind the Petronas station. There are also others in Kuala Lumpur so check their website on the locations. *Disclaimer: The opinions expressed here is entirely based on my personal tastebuds and may vary for others. The reviewer also declares that she has not received any monetary or non-monetary compensation from the restaurant/stall for writing this review. One of my all time favourite snacks - the humble putu piring. 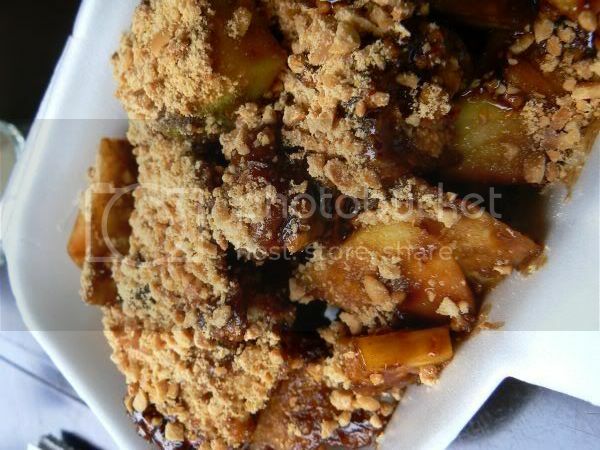 Made from rice flour that is packed into a metal container and filled with gula melaka (palm sugar), it's utterly delicious. I often stop to taste this snack whenever I see it since I have been on a quest to search for the perfect one. Most places I have eaten just don't make it up to standard. For instance, the stalls in front of Giant Kelana Jaya like to pre-make theirs with a quick reheat when a customer orders them. This means you don't get a fluffy cake but one with a sub standard taste to it. Although the girls in front of Bangsar TMC are pretty good, I often find they skimp on their ingredients as the balance of gula melaka (palm sugar) versus the rice flour was not in proportion. I stumbled on to this stall located inside a roadside van at this night market. 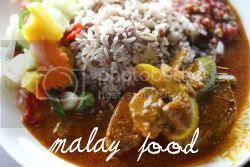 The market is popular among students from the nearby Islamic University Matriculation College and the University Malaya students who reside in Section 17 searching for a cheap meal for dinnertime. 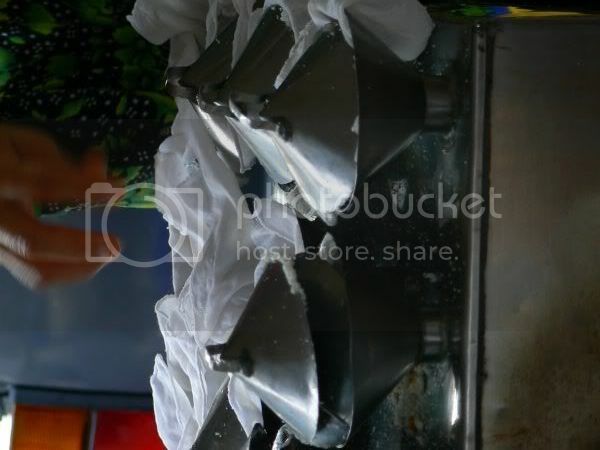 Run by a couple, the lady has the task of packing the rice flour and gula melaka into the tiny metal container which resembles a "piring" i.e. a plate. It's then placed in a specially built steamer with conical inserts on top of white cotton cloth. Then it's covered with a conical metal lid and left to steam for a while. As and when orders are placed, they will reach into the steamer and remove the metal containers and cotton cloth squares. 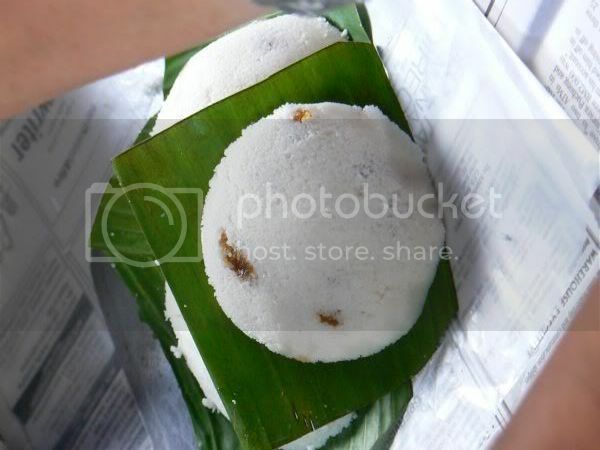 Grated fresh coconut is placed on the putu piring and then covered with a square of banana leaf. This is all packed in a plastic and newspaper parcel, ready for you to take home. For additional flavour, this stall covers the stack of putu piring with a square of banana leaf before folding the parcel. Best eaten piping hot, this putu piring was fantastic - the right balance of sugar and flour coupled with a fluffy texture and the fresh grated coconut. Simply sublime for a mere RM0.40 per piece. Besides this version, there's also putu bambu which is made in cyclinder bamboo containers. So far, the one which I have tasted and kept reverting back to has been the small stall located in Kampung Baru. Nowadays, everyone is so into xiao loong baos that restauranteurs have cashed in on the craze to open a string of outlets. There's the ever expanding Dragon-I who seems to have taken over almost every major shopping mall, the Singapore Crystal Jade and local spin offs from Chef Loong, Shanghai 10, Tu Long at Mid Valley Megamall and etc. Hence I guess it was no surprise that Nanxiang Mantou Dian opened an outlet recently at the Curve. Boasting close ties with Nanxiang, the place where the steamed soup dumplings originated, this outlet is in direct competition with Dragon-I who also opened an outlet at the branch. There's something so fascinating about the xiao loong bao - the sweet soup broth and the melt in the mouth meat filling encased in a thin wheat flour skin that one never can get enough of. 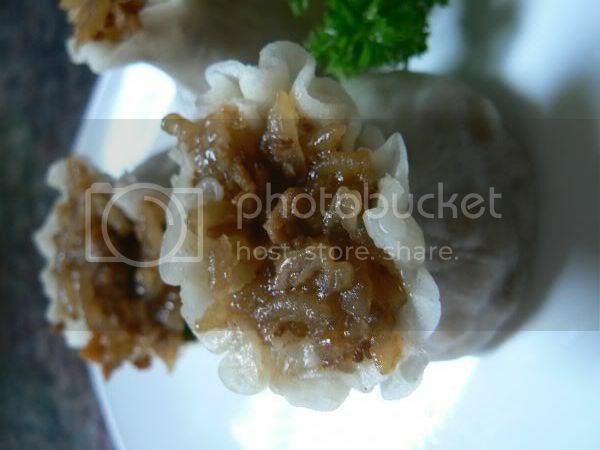 Each dumpling is said to have eighteen pleats or more depending on the expertise of the maker. 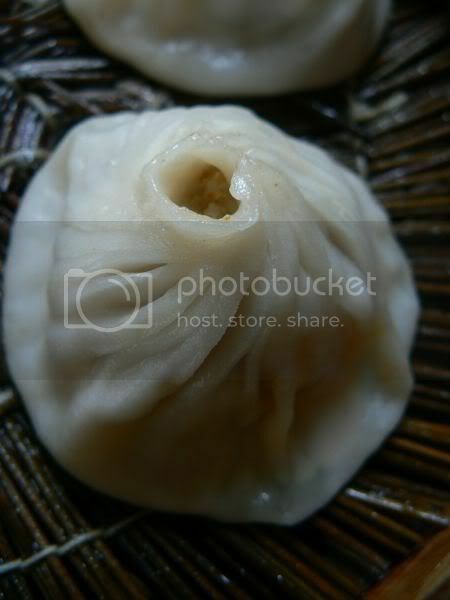 To get the soup within the dumpling, superior soup is boiled and cooled into a gelatinous mass. 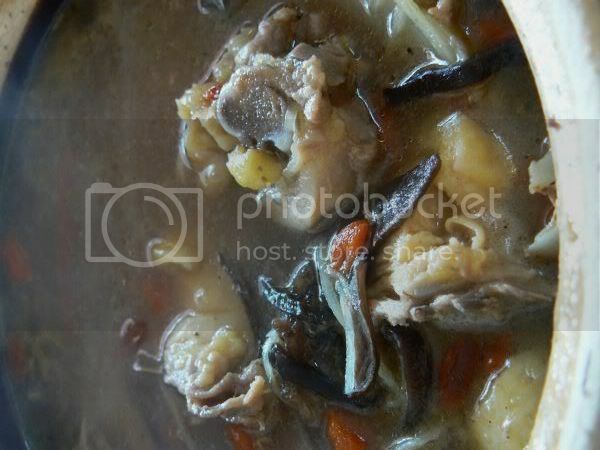 Usually chicken feet or pork skin is added to the soup which helps it gell. Some places chop it up in small pieces and mix it within the meat mixture while others cut them into bigger cubes whereby the minced meat is wrapped around it. One thing is certain at this outlet - it definitely carries the widest range of xiao loong baos in town. 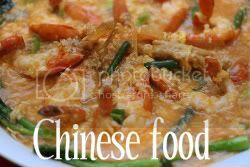 There's various types for you to choose from: plain minced pork which is the traditional version, vegetables if you're on a vegetarian diet, mixtures of pork with shrimp or mushrooms. 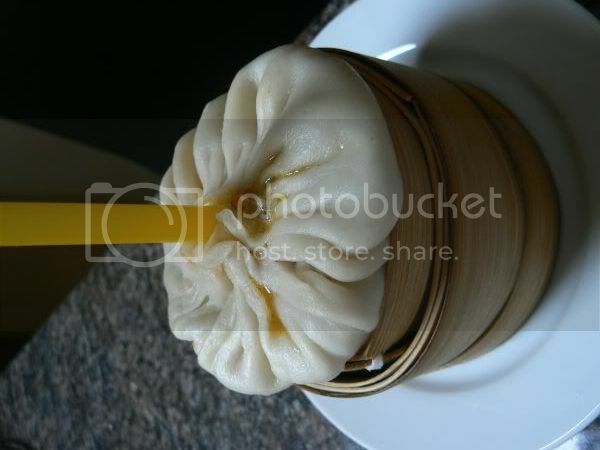 With prices ranging from RM12 to RM16, it's served in a bamboo steamer which holds all six dumplings. There's even a superior range which has a choice of sauteed crab meat, fresh crab meat, crab roe or imported matsusake mushrooms with a range of RM18 to RM32 for four pieces. 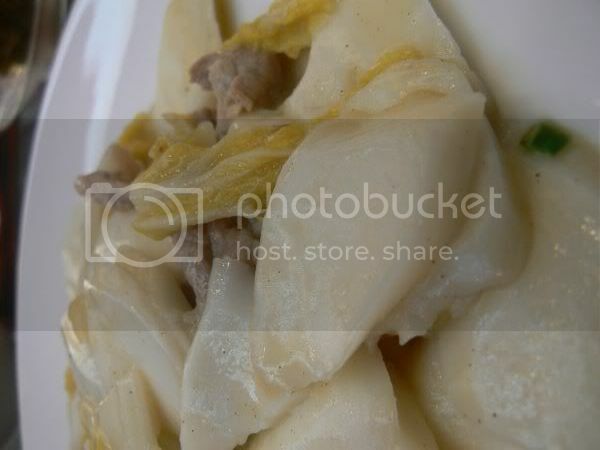 Tastewise, the dumplings are not that fantastic - the traditional ones taste pretty ordinary while even the addition of crab meat and crab roe does not make a difference to the dumpling. This place also serves steamed dumpling with crab roe soup filling (RM15) which is pretty unusual albeit pricey. I like the soup within as it's sweet but the skin of the dumpling is definitely thicker to withstand the weight of the soup within. There's also various steamed items they serve on the menu. We tried their version of siu mai -steamed glutinous rice dumpling with chinese ham (RM1.90 per piece). Although it looked pretty like a flower, it tasted mediocre. 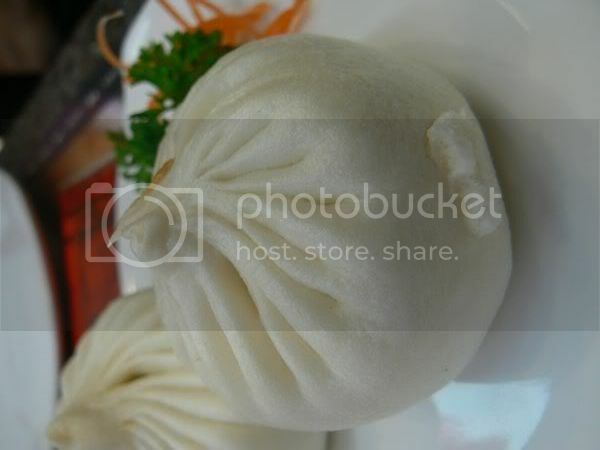 My friend insisted on these steamed vegetable bun (RM3.50). It wasn't as nice as the ones she tried before so this was voted as another item we won't order again. We also had their fried slice glutinous rice with shredded pork and preserved vegetable (RM12) which is also known as Shanghai Nien Kao. This was pretty good but may taste bland to those who like theirs with more spicy kick. 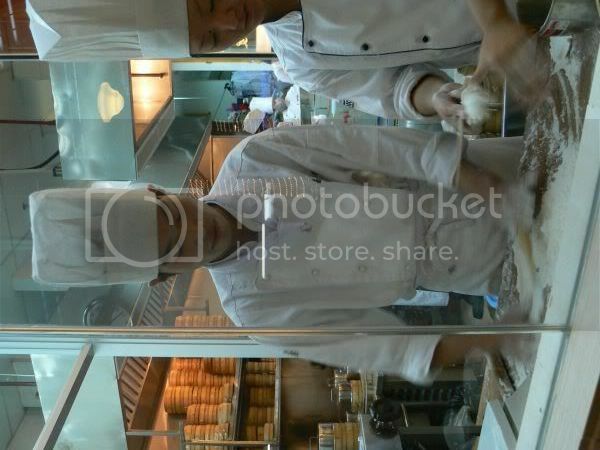 They also serve a few Shanghainese dishes here namely the famous sauteed small shrimp and lion head meatballs. We tried their deep fried marinated pork ribs served with salt and pepper (RM16) which reminded us of chicken nuggets from McDonalds. 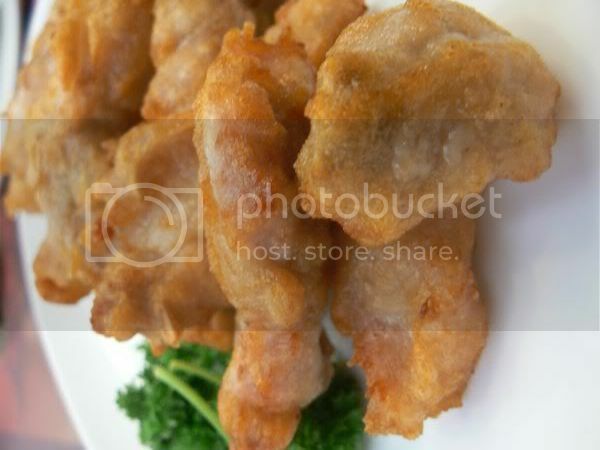 In fact, when I labeled my photos I thought they were chicken pieces since I was thinking more of their taste. 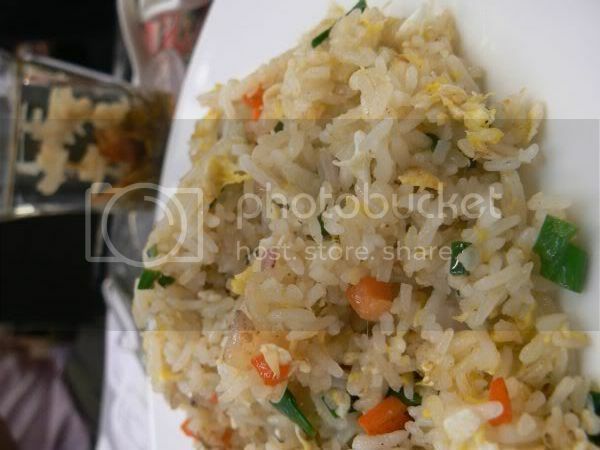 Although most of the food was average or dismal, what was extremely good was their Shanghainese Fried Rice (RM8). 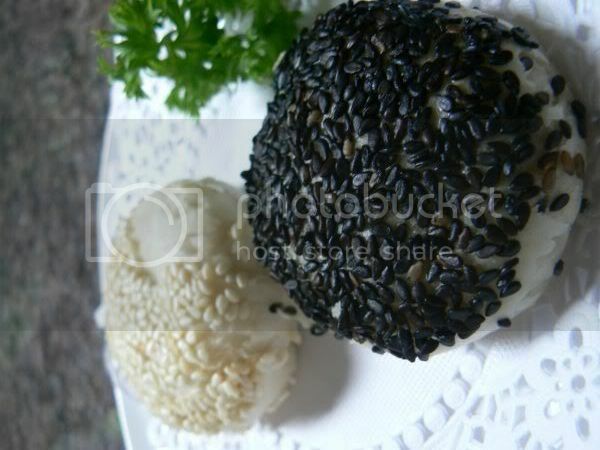 Fluffy grains of rice which were extremely fragrant. The rice was also not soggy with oil - a definite plus point. For desserts, we tried their puff pastry with cashew nuts (RM2.80 per piece) and puff pastry with red bean paste (RM2.20 per piece). I can't remember which is which but I remember I liked the cashew nuts version much better. Overall, I thought the food here wasn't fantastic but I did love their Shanghainese Fried Rice. Service for me was fine even though it was a busy Saturday night or a lazy lunch. Do go through the other reviews section to read other write ups as some had bad experiences with this place. 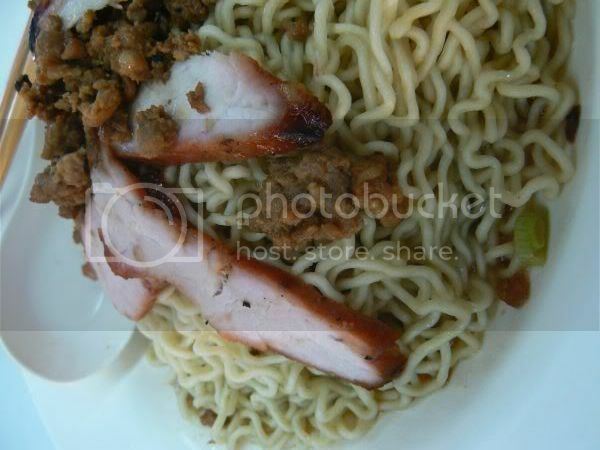 More soupy noodles - this time round the ever popular pork noodles. Unlike yesterday's stewed beef mince which takes time to prepare ahead, these noodles are cooked a la minute. At this popular stall in Petaling Jaya, as and when you place the order, they cook the noodles. 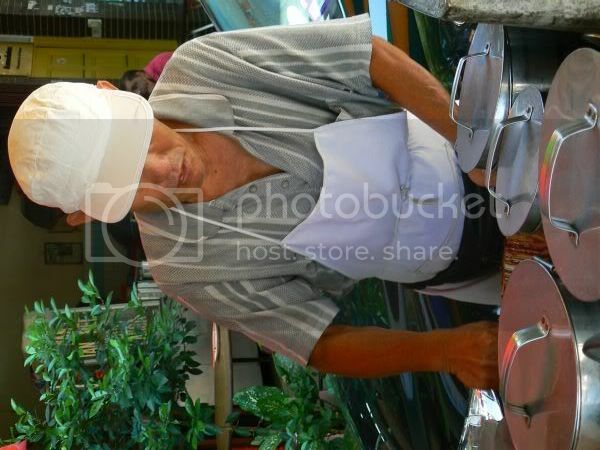 The man who runs this stall uses a huge metal saucepan with a lid to cook the sliced pork, minced pork, pork intestines and liver with pre-prepared stock for a few minutes over a large fire. Vegetables are also added while the noodles of your choice is cooked seperately. Usually depending on their orders, he will cook at least 5 bowls of the soup in his huge pot at one go. For my version, I also asked for an egg which is poached in the hot stock. 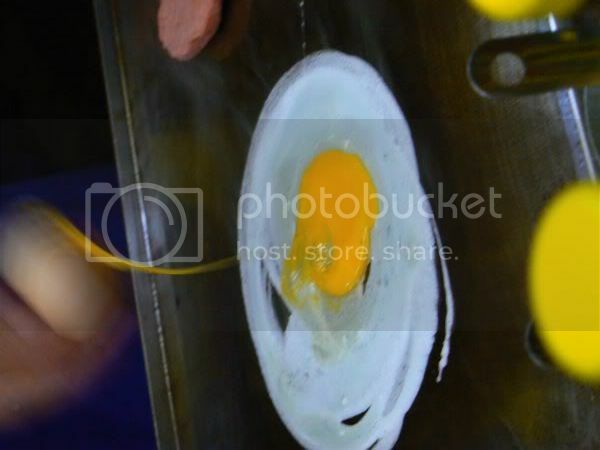 Break the egg to add extra flavour to the broth. This remains one of my favourite places to eat this type of noodles. It's not as sweet as Kean Fatt's noodles which I feel could be artifically enhanced. Moreover I hate waiting for my noodles at Kean Fatt and this place, although it has a steady flow of customers, it's not as super busy as Kean Fatt. Every once in a while when we're down town doing a spot of shopping, this inevitably ends up being a stop over. Located at a tiny space right at the back of a pre-war shophouse, it's hard not to miss this place as it faces the busy main road of Jalan Tun Tan Cheng Lock where everyone travels past. For me, it's a triangle of food - stop by here for a quick brunch/lunch, drop by at Tong Kee's stall at Lai Foong coffee shop across the road for egg tarts as dessert or a teatime snack and end up at the medicine shop nearby to stock up Chinese dry good supplies. Although you get a choice of noodles here - my ever favourite is the loh shue fan which literally means mouse tail noodles. Short and stubby, these noodles absorb the flavours of the stewed minced beef beautifully after a quick stir. To accompany your dry beef noodles, choose a selection of beef cuts with soup - springy beef balls, thin beef slices with a melt in the mouth texture and slightly chewy intestines. 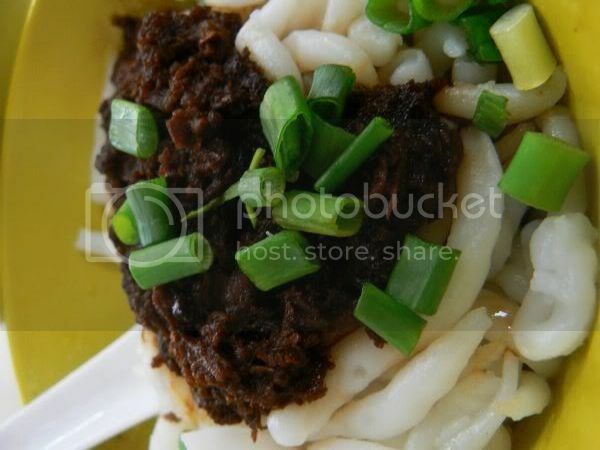 I love the tender beef slices and will savour each mouthful with my noodles. The stall has also adopted an easy way to collect monies from their customer - each bowl of noodles has a fixed price of RM5 whether it's small or big. Depending on which size you order, the person who cooks it will adjust the portions: whether it's more beef slices in the soup versus the noodles. If you crave for these noodles at night, visit them along the busy Chinatown streets as they also open a stall behind Hong Leong Bank Berhad. 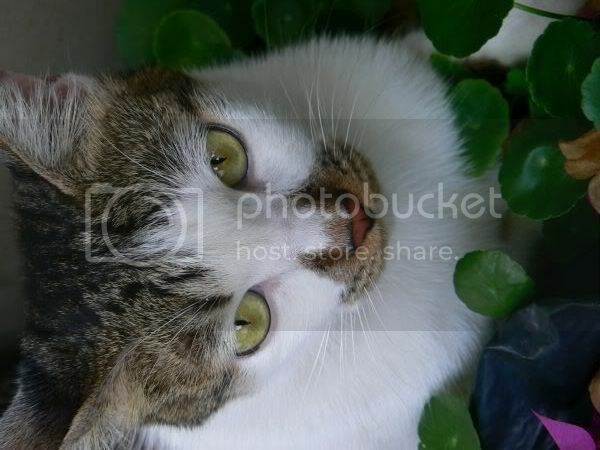 Weekend Cat Blogging (WCB) 93 - Happy St Patrick's Day! Happy St Patrick's Day! This weekend let me reveal to you Mr. Green Eyed Monster. Although he does look sweet and innocent here, he was a naughty fella today. It started out with him having to share my attention with another kitty - the mummy cat who also comes over. He wasn't happy at all hence there were a lot of chasing round the house and snarling happening this afternoon. I finally managed to get everyone to calm down but the mummy cat refused to pose for any pictures since she was ruffled and angry. This fella did let me snap a few pictures of him before he also high tailed and decided to chase his sister, Fluffy around the garden. 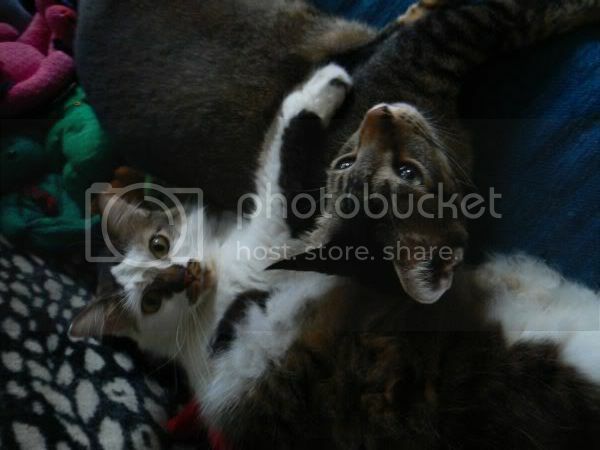 For more kitty pictures and stories, visit I Got Two Shoes with Kamikaze and Jenn for the WCB Round Up. For the foodies especially the locals, do check out two television programmes this weekend which are especially interesting - Ho Chak Season 3 on 8TV (Channel 18 on Astro) and Taste of Jason on AEC (Channel 19 on Astro). Both actually clash as they're on Sunday, 6 pm but I usually watch the repeat of Taste of Jason on Monday, 10 pm instead as 8TV don't do repeats. Both shows introduce various restaurants/stalls and get up close and personal with how they prepare the dishes. While Ho Chak features three places per episode, Taste of Jason focuses on one place and his interview is really in depth. Last week, he featured Wei Kee's Roast Goose in Pudu and it was so fascinating to see how they prepared the goose and roasted it in a specially made oven with charcoal. I didn't even know they had kerabu goose feet and jellyfish here until I watched the show. For those who don't speak or understand Mandarin which is the medium of these two shows, there are Malay subtitles which allow you to follow the shows. Have a good weekend and remember to tune in to the telly. For those Formula 1 fans - the high pitched whine is back with the start of the Melbourne GP so we'll be glued to the telly this weekend. I must admit that I seldom wander around the Chow Kit area but I'm slowly exploring the place bit by bit and discovering it's wonders. Nowadays, the place is heavily occupied by Indonesians who have come here to work. Even when you visit a newspaper stand, you will see copies of the Jawa Post right next to the local papers. Last weekend, after reading Eating Asia's entry on Bakso, we decided to give it a try. It's pretty easy to spot the restaurant as it's just off the main road. Right before the restaurant which is next to the KL Monorail entrance, you'll pass by a string of pawn shops. Being a cat lover, I was fascinated with one particular pawnshop as it had a beautiful cat sitting on it's glass counter. Since it was the weekend, the place was packed with Indonesians enjoying their lunch hence we shared a table with two Indonesian ladies. 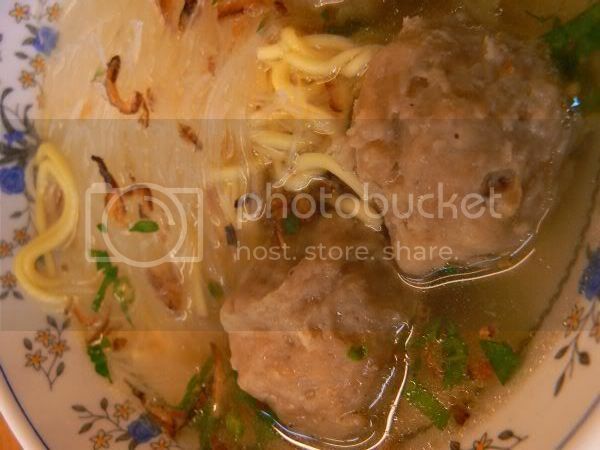 We ordered a bowl of Bakso each (RM3.50) which came with a mix of yellow noodles and glass noodles and a clear broth. 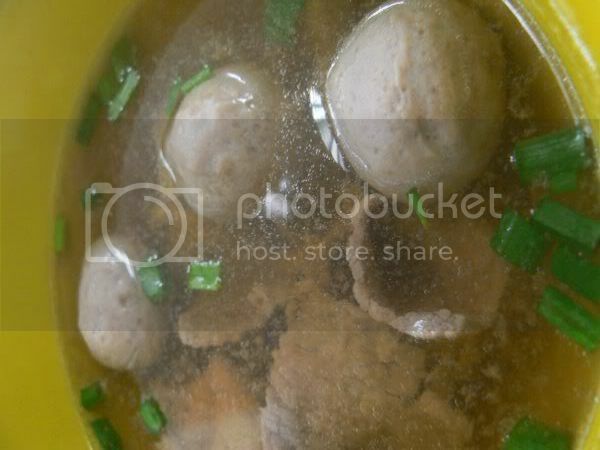 The bakso was pretty good and not too chewy and rubbery. I spotted one of the tables having satay hence I asked the waitress what it was since there was no mention of any satay on the menu and she said it was "satay kambing". Curious, I ordered a plate of five sticks (RM0.50 per stick) to share. Totally unlike our local satay, it was served with kicap manis and a sprinkling of chopped bird eye chillies. Accompanying the satay was chopped lettuce, tomatoes and onions. We were also given a large plate of white rice to eat with the satay that we declined. Per our conversation with the two ladies at our table, they advised us in Northern Jawa, they eat their satay with a plate of rice. We both loved the satay which was tender and slightly smoky from their time on the hot coals. Even the kicap manis went well with the satay and was a nice change from the usual peanut sauce. I was actually looking for the Es Cendol but despite how many times I asked, they could only prepare me this Es Campur which was filled with home made jellies in red and green. Topped with chocolate syrup, it was pretty unusual and surprisingly, not very sweet. 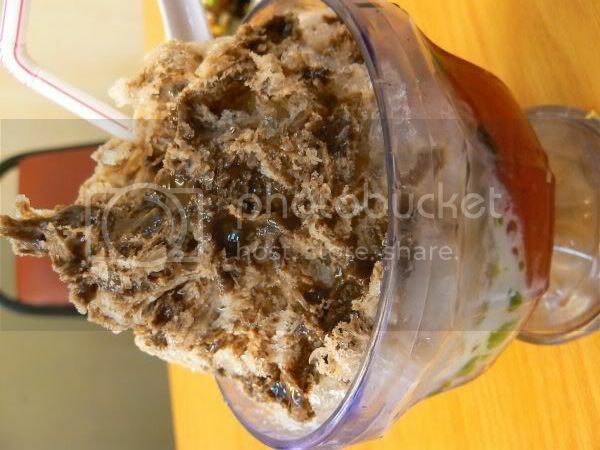 Besides this Es Campur, they also serve the Es Teler with fruits and Es Kelapa Muda with shreds of young coconut. The two Indonesian ladies were totally fascinated with both of us since we stood out like sore thumbs in the restaurant but they got pretty chatty to us once they knew we could converse with them in Malay (I think they thought I was Japanese since I was snapping pictures). We both enjoyed our meal here especially the satay. Besides these items, they also serve pecal, gado-gado and various cooked curries and dishes that you can self serve from the counter. Once in a while when I'm sick of eating Malaysian food, I crave for something different. Being totally adventurous, I'm game for anything and have been looking for a Burmese restaurant for a long time. Even though this restaurant has been at Sogo for quite some time, I never noticed it until I was directed here by a Burmese friend who highly recommended it. It was a good recommendation as we totally enjoyed the food here. The menu is quite extensive but we ordered a few favourites coupled with recommendations from the restaurant manager. First, we had the famous Burmese Laksa known as Mohingar (RM4). Expecting spiciness like our local laksas, we were surprised to find a mild curry sauce with fish, pumpkin and cut up vermicelli noodles. You are given freshly squeezed lime juice and chili flakes for additional flavour. Although it was mild tasting, we totally enjoyed it and slurped it all down. The restaurant manager recommended us the Kalathar Curry Chicken (RM15) which was served with chunks of chicken and potatoes. 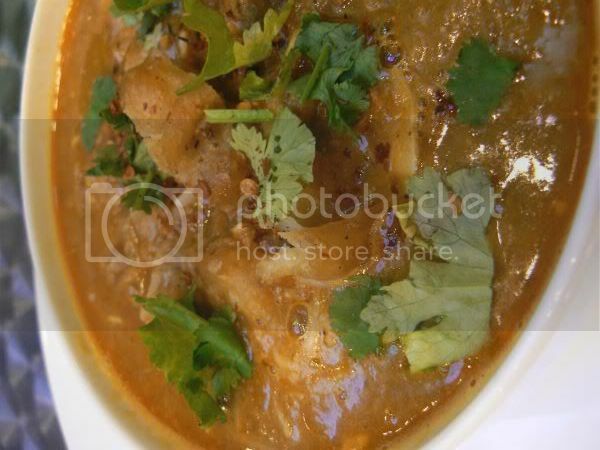 Unlike the Mohingar, the curry taste here has a strong cumin flavour. Our favourite was the Hilsa Fish (RM25) which is also strangely known as Forget Me Not in their menu. Even though it doesn't look too good in the pictures, believe me it tastes incredible. Imagine eating a large sardine with a delicious tomato based sauce. To get the texture of the fish and the soft bones which is edible, the fish is steamed in a huge pot for thirty minutes. 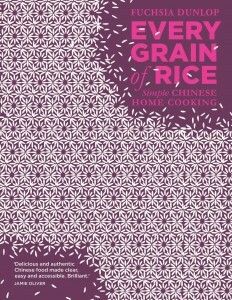 This should be taken with lots of rice as it's incredibly more-ish. 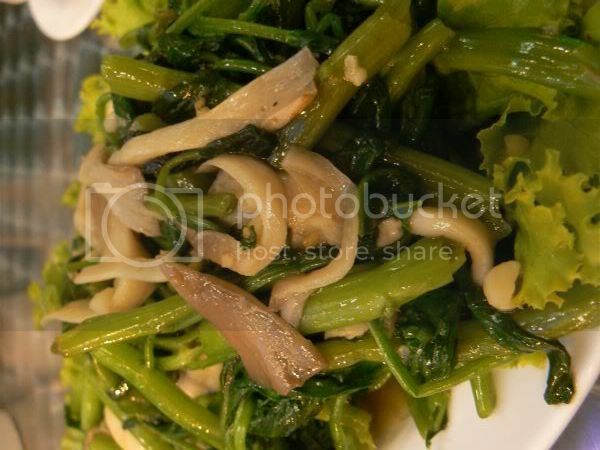 For essential greens, we had their stir fried water spinach with mushrooms (RM10) which was not too oily and tasted really good. If you wish for a change, give this a place a try as the prices are reasonable. Even the foreign workers dine here to sample a taste of their home country. Fans of the famous Meng Kee Char Siu who live around the Petaling Jaya, Subang Jaya and Shah Alam area can now rejoice as there's a branch at the Hicom Glenmarie area. No longer do you need to fight the down town traffic to indulge in your sticky charred char siu anymore. Located at a corner shop facing a field, this restaurant serves wantan mee with char siu and breakfast toast and eggs for breakfast. For lunch, it's their famous char siu and their steamed chicken or roasted chicken whereby the chooks are from Bukit Mertajam. After sampling the char siu a few times, you can tell the slight differences between the two branches: here the char siu is not so sickly sweet and there's not many too charred bits. 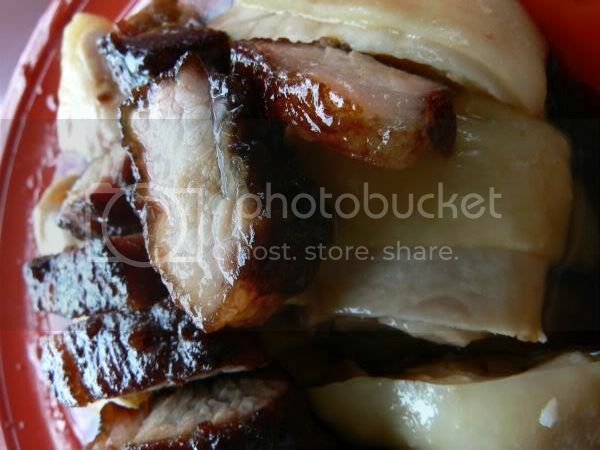 A definite plus point with me since I hate too sweet char siu and abhor those hard overcharred bits. I also prefer the steamed chicken here as it's the meat is tender. If you do drop by here especially for lunch, be warned as this area gets packed with the people who work at nearby offices and factories looking for a bite. For those of you who follow my blog regularly, you will remember me raving about the food at Max! Kitchen and Wines before. Friends who have dined there have returned to say the food is great. For us, we keep visiting this place as we love the food here. Sadly I can't make it for this time round as it falls on the same day of Splashie Boy's annual dinner and dance which I just found out last weekend. Sniff! I was really looking forward to going as I love the food there plus some of the bloggers were keen to also try out the place. Unfortunately, his annual dinner and dance is something we can't get out of. If you're keen, email rsvp@klue.com.my before 20 March, 2007. Sorry but I couldn't resize the picture to a thumbnail size hence I'm cutting and pasting information from it here. It's strange how there are some parts of Kuala Lumpur which I have not been for ages. One of these places is Kepong which has now been completely transformed with the emergence of new development. There's a huge Carrefour and Jusco plus lots of shophouses which now house numerous businesses and restaurants around this area. In a way it's a good idea to rejuvenate the place but it's also sad to see the older shophouses pushed to the back and the side as the newer ones take over prime spots. One day, we decided to make a trip here to sample the yong tau foo which Babe in the City - KL had highly recommended. It's pretty easy to locate the place as it's just next to Carrefour. Lots of competition around this place for customers as already in that row of shophouses, there's two to three restaurants vying for business. Although they mainly sell yong tau foo items, they also have a pretty extensive list of dishes such as vinegar pork leg, steamed stingray (something unusual as it's usually grilled) with various sauces, fried paper chicken, prawns with salted egg yolk, steamed cuttlefish and etc. We ordered a selection of their yong tau foo and was surprised to see them serve it with soup and lots of sweet potato leaves. That was definitely a plus point for me as I love sweet potato leaves and it was nice and healthy too. The bittergourd stuffed with fish paste was not bad and I loved the smooth texture of their tofu. We also ordered a small selection of the fried items - the bean curd and the aubergine. 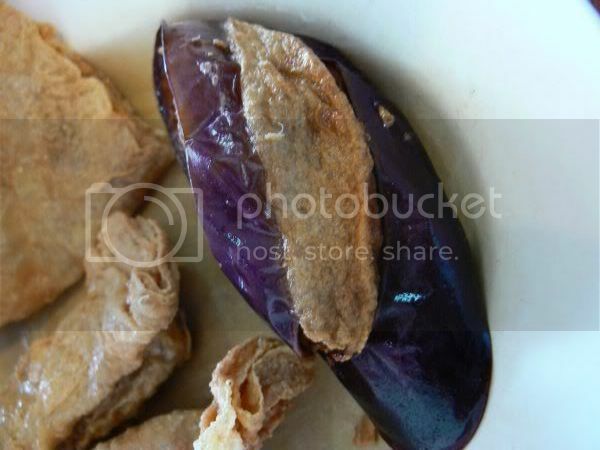 It's all fried as and when you order it so it's fresh and nice but I did find the aubergine to be slightly oily as here it's deep fried versus pan fried in other places. What was really good was their rice wine chicken, a favourite of mine. With the right amount of rice wine added, chunks of free range chicken, shreds of ginger, black fungus strips and kei chi (Chinese wolfberries) in the claypot - it was simply heavenly right down to the last drop. Drink it up when it's hot and eat it with plain white rice as it's delicious. It can be quite "heaty" for this hot weather though so be prepared to sweat it out. 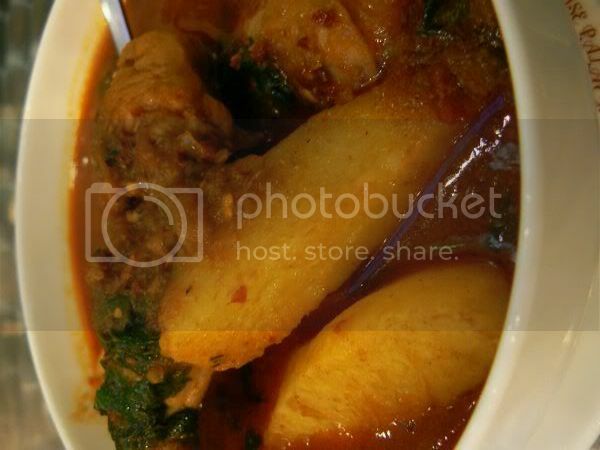 Besides this chicken version, they also serve it with prawns. This dish definitely made the journey and the toll payment worth it and I'll definitely return to sample this again. Recently, we re-visited Fong Lye, a favourite for Taiwanese cooked dishes with porridge served with sweet potatoes or rice. It's always advisable to eat early at this place or else it gets super packed with people. If you do happen to end up here during peak dinner time, be patient as sometimes the food can take up to 45 minutes to arrive. Since it was the two of us, we ordered only a few items from the menu. 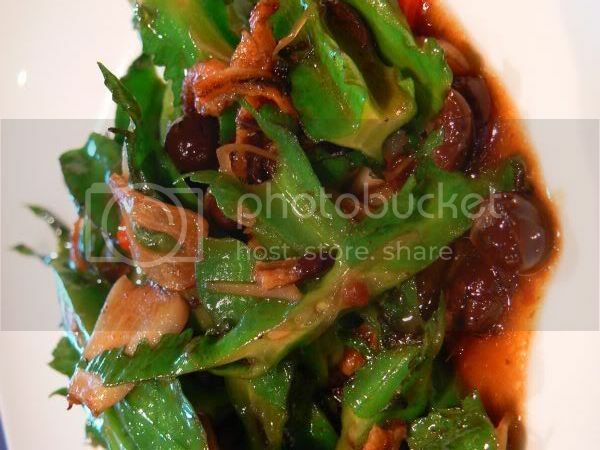 First, was their fried four angled beans (RM15++) which is one of my favourite vegetables. 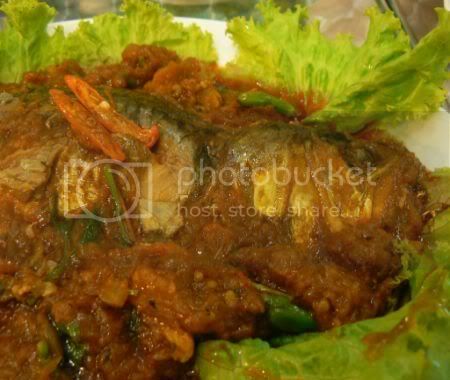 Fried with whole soy beans, deep fried ikan bilis (anchovies), garlic and chili, it's delicious eaten with lots of plain porridge. I especially love the whole soy beans (this is the fresh version which soy bean paste is made from) but be careful with the seeds inside it. 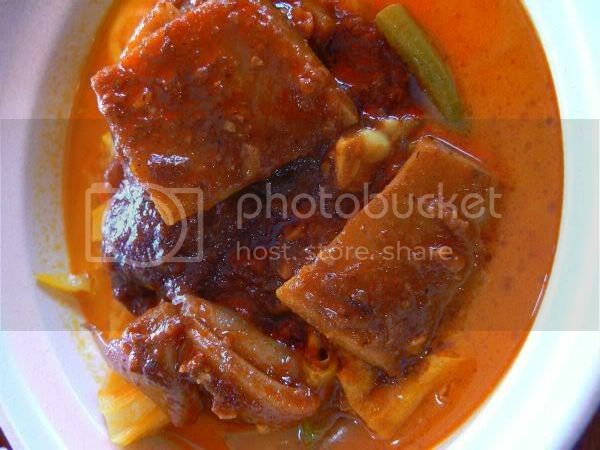 Although most people order bittergourd with sliced pork or chicken, the original dish is actually fried with beef slices. Known as Fu Kwa Ngau (RM16++), this dish is done really well here. 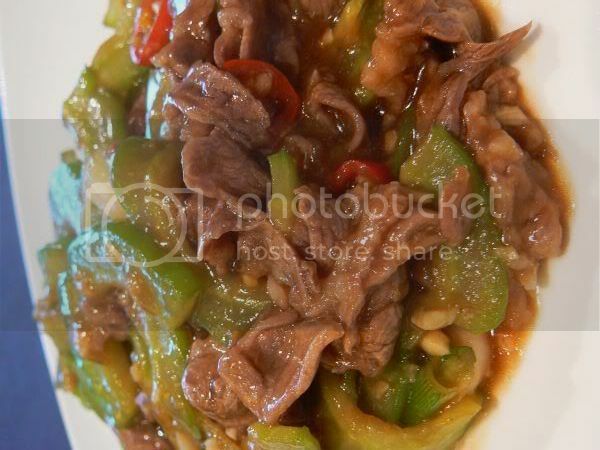 Tender beef slices intermingle with the sliced bittergourd coated in the sauce flavoured with soy bean paste. It's not on the menu but ask for it and you won't be dissapointed. 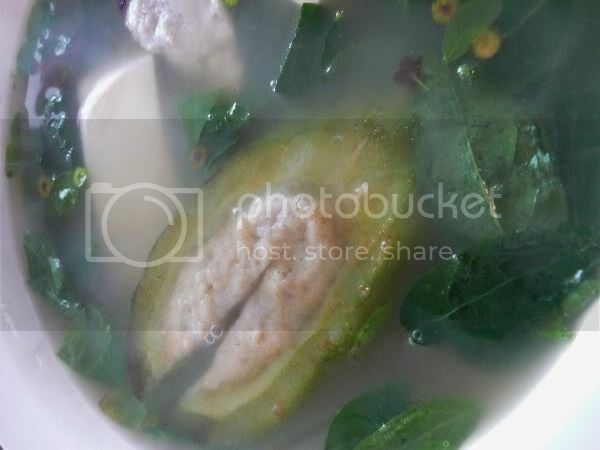 If you have eaten the famous Taiwanese dish, the Three Cup Chicken, you will notice they use basil leaves in their cooking to flavour their dishes. 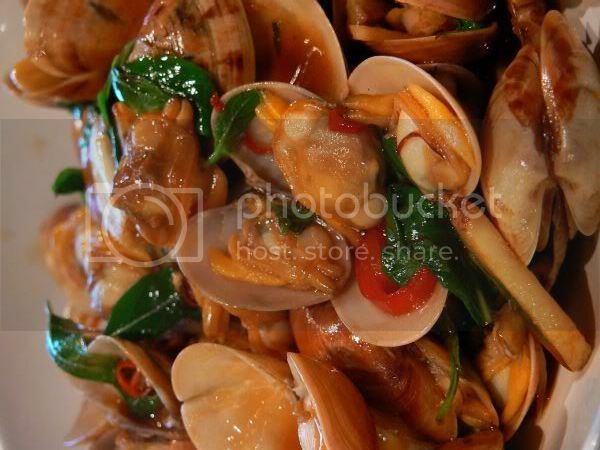 In this unique dish, clams (RM15++) are fried with garlic slices, cut red chillies and basil leaves with a touch of soy sauce to give it flavour. Simple but extremely aromatic, this is so delicious as the flavours don't drown out but enhance the sweet taste of the clams. No desserts here but they do give you a small shot glass of a lemon drink to cleanse your palate after the satisfying meal. Most of the customers here are regulars so don't be surprised if you keep bumping into the same people all the time here. 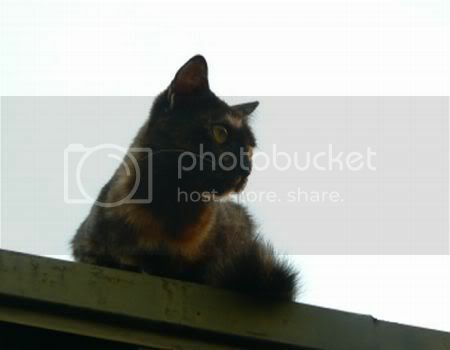 This weekend, Fluffy has decided to reveal her love for heights to all of you. 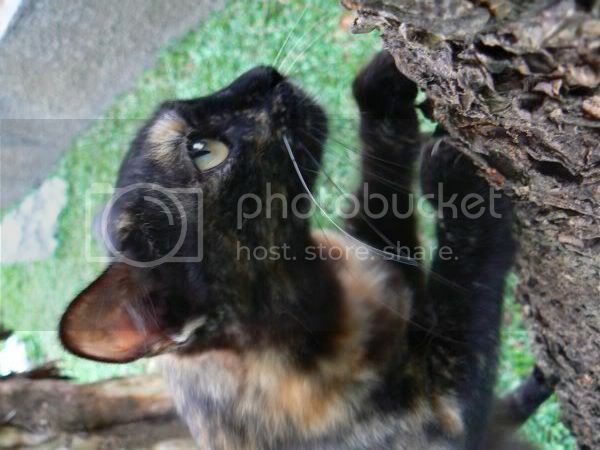 The cats love to bask under the shade of this tree which hangs over this wall. Perfect place to hide from any prying eyes and also from the heat. Another favourite spot is on top of the roof which is the night time hangout place. Not sure why but I suspect this is probably one of the ways to avoid those stray cats who can get quite aggresive sometimes. 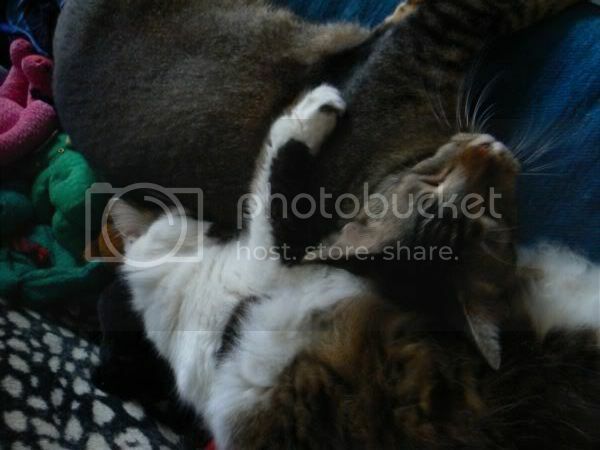 For more kitty stories and pictures, visit Upsie, Sundance and Sher at What Did You Eat? Upsie's the heroine of the moment for Fluffy as she's the BOSS!